Overshadowing the fact that I am finished my bridge project and did an excellent job somehow, is the memory of being violently shoved by riot police on my way home from school on Monday night. Something about this is so shocking... I can't forget about it. First things first, I've been working like a crazy person for the last 2 weeks. I finished everything I wanted to finish and put together a really nice presentation which I will post here. I am sad because I didn't get to go to as many climate events as I wanted to. I visited a few exhibits with Jed, and we passed by lots of demonstrations, but with the stress of finishing our projects, couldn't afford the time to get arrested for peaceful protesting. Although I dearly wanted to. The events surrounding the climate conference here are confusing and frightening. Police arresting hundreds of people? Giant steel holding cages? Police blockades everywhere you go? Being looked at suspiciously if you glance sideways at the Po? It's like a repressive fascist regime here, where I get the feeling I'm doing something wrong even if I'm not. What happened to all that free-speech blah-blah? I guess the police know best, hm. Probably better just to shut up and follow along. Makes you want to do the complete opposite. 1. 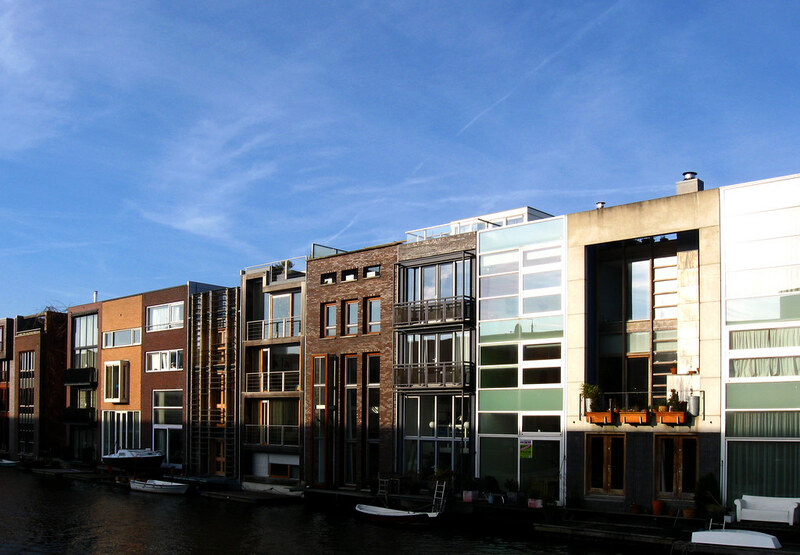 The area is a new development called Sluseholmen, which has been planned like Borneo-Sporenburg in Amsterdam. The difference being, that Copenhagen doesn't have a culture or history of canal-rowhouses like Amsterdam, so the effect is farcical and alien. But hey, why create your own culture when you can just directly copy someone else's? 2. The facades of the apartments in Sluseholmen are linear and clad in different materials. It's so obviously a new development trying to look old, that it's kind of sad. The most interesting time to be there is at night, when the garish facades fade into the background and the lights from people's apartments come on. There's like a rule that you can't have curtains here, everything must be out in the open (carry over from 'nothing to hide' Protestantism?) so, well, you can see everything. But it's kind of a nice atmosphere to have these huge windows shining light onto the water. 3. I wanted to use the night-lights as my inspiration for a bridge. I also thought that the site, which was so planned and man-made, could use some softening. So I decided on arches as my main structural concept, to contrast the sharp, linear quaysides and buildings. I also decided on a double curve in plan and elevation, making this a difficult idea to conceptualize in drawings. Should become a positive addition of public space where there is none. I did this sketch-up site model to study the sun position and angle throughout the year to see where the site is getting the most/least sun. It's a pretty important thing in a place where it is dark for a long time in the winter... Hopefully even for you non-architectural folks, it's obvious that in June we get a great deal of sun coverage, and there are lots of long shadows due to the low sun angle in December. The sun chart shows the azimuth and altitude of the sun, but it's not that important. Then I have a rendering showing the effect of the sun on my bridge on a November afternoon, for example. The top picture shows the corners I want to connect: the corner on the left is the larger orange circle on the map, while the corner the photo is taken from is the smaller circle. You can see that there is an existing dock area on both sides of the water, where people can get quite close to the water. I thought it would be nice to connect those two docks as a continuous stroll. This gives an overall impression of the site, you can see on the southern part that the area is very strictly planned, with constructed canals and courtyards. The thick red dotted lines mean that car traffic is on those streets, while the smaller dotted lines indicate mainly pedestrian and cycle routes. From my initial ideas about a sweeping curve, to a sketch model I made showing the wavy effect of the arches I intended to use. An impression of how I see my idea acting in the context of the site. The main idea was that I use the colored lights that reflect at night, and put them onto the bridge during the day as well, so that the people using the bridge have an interesting experience while passing over... And I wanted something which fit into the context, not just a sculptural object that has nothing to do with the surroundings. Yeah, about that. Well, I thought it was a bowstring-arch, but it's actually an arch-truss system. I was informed yesterday. But my instincts were correct, and it does actually work. The idea is that the arch and bridge act together like a folded plate, with structural ribs and the panels act as sheer panels. The structure comes together in the centre on a pivot point, and then is carried down with concrete columns into the water. That means there is about a 25m cantilever on either side of the pivot point, but because I am using a relatively light construction, it can be easily achieved with steel. Here are two cross sections through the bridge (not to scale, not for construction) showing the main structural elements. I was asked to change the profile of the I-beam to a circular member which is better suited to a curve, and that makes sense. Otherwise, it's working pretty well. The large ring at the bottom is where the bridge actually turns on rollers or a track. And of course that ring would sit on concrete, which is going down into the water. So how does the bridge actually open? each piece turns 30 degrees on its circular pivot point, to allow a clear opening of 30m (double the requirement) for boats to pass. I tried to do most of my renderings on cloudy atmospheres, to show a realistic impression of what it's like here, and that my panels still cast light onto the bridge and water even when it's not sunny out. I think most architects try to forget about what their architecture will look like in bad weather. But I want the city to look beautiful all the time. Here you can see what it's doing in plan (curving in 2 directions) and in elevation (inclining to the middle, where it flattens out for the two opening pieces to meet, then slopes down to the ground again). Sorry I don't have the water or shore shown in the elevation, I just didn't have time to throw it into my PDF here. But it was on the real elevation that I printed to scale. 13. Rendering on a November afternoon when it's mainly cloudy out. Maybe you can't see it that well, but there are benches separating the bike lane from the walking lane. This one gives the impression of the light coming through the panels onto the bridge deck, and you can see the colored reflections. I think it's really nice! As mentioned, I got my inspiration for the panels from the window-lights at night. So I wanted the panels and lighting scheme to be a bit random. It's also really important at night that the lighting scheme emphasises the movement of people over the bridge, and not the structure. This is because the bridge is a public space, and you don't want it to be a creepy place where actions are shielded behind these panels. So I am proposing a sort of 'shadow puppet' display at night, where lights shine from within the benches and cast shadows onto the panels. The upper panels where the light can't reach will be lit from within by LED's, in a different pattern every night. To keep people from being blinded by the projector-like lights, I did a lot of studies with brightness, color, and intensity of light. I also studied the kinds of shields you can put on lights to prevent people from seeing directly into the source. I found these sculpture shields used when lighting outdoor sculptures in public places, which are like window-blind slats vertical to the light. Works really well. And you can see Jean Nouvel (famous french architect) in silhouette against a material which could be used for the panels. That's the sort of effect I'm going for. This is just some details about the structure of the panels and how they are attached, and the different effect you can get with either polycarbonate panels or Corian panels. And a small image of how I came to the pattern of my panels. 17. Here's my favorite rendering, showing a June morning crossing the bridge, and how the light comes through in the morning. I also like how it shows how the bridge is attached to the existing dock structure of the quay in a really unobtrusive way. Well, I like it. A final picture of what the bridge looks like from the shore, on a fall afternoon. That's it! Actually I have some 1:10 scale details of the structure and handrail and bench lighting, but I haven't scanned them in yet. So anyways. That is the fruit of my labor of the past 2.5 months. Going to get change for laundry now. More about the Po and their bad behaviour later.